Beer tastings are a fun way to gain an education. Many would scoff at the idea that drinking beer is educational, but if you consider that beer has been a part of human civilization for over ten-thousand years, you may wish to reconsider your immediate impression. Tasting beer sharpens the sense of smell. You pay closer attention to the aromas emitted by foods, chemicals, and water. You become more aware of your surroundings. So enticing are the flavors, that you cast aside thoughts of overindulgence in exchange for the opportunity to taste the hop that was used, or the sour fermentation that resulted from the addition of Brettanomyces. You become enamored by the history of man in other countries. The thought of monasteries (and beer) being destroyed during war presents a different perspective. Pasteurization becomes fascinating. 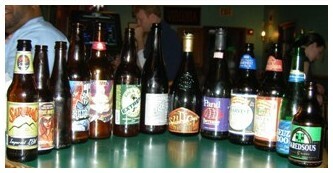 Beer tastings are popular in Brewpubs, Beer Bars, and Restaurants who carry a well-stocked selection of beer. Festivals often present seminars that offer tips on beer appreciation. You might even find tastings in adult evening schools, colleges and universities. If you cannot find one to meet your satisfaction, consider forming your own group or club who will meet at a specific time and place on a regular basis. Sampler tastings – Common in brewpubs, sampler glasses of beers are served from light to dark or from low alcohol content to higher. Horizontal Tasting – Beer from several different breweries, but within the same category, are analyzed for similarity, singularity, and overall impression. *The Wet Hop Beer Festival at the Bistro, Hayward, California, USA. Vertical Tasting – This is a sampling of several "vintages" of one beer style, different years, crafted by the same brewery. Such tastings serve as highly educational tools, because they demonstrate the effects of terroir, aging, storage, yeast, various brewing methods, and possibly, the mark of the brewmaster. Many beer connoisseurs prefer this method for Barley Wines, Belgian Beers using wild fermentation methods, barrel and wood-aged beers, and winter warmers. 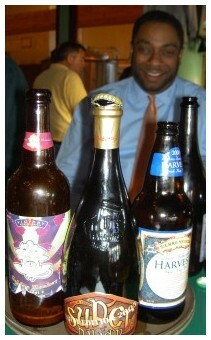 Terroir Tasting – The same basic beer recipe, brewed in different locations throughout the world, are compared. This may contrast Northern Hemisphere vs. Southern Hemisphere; those brewed in Ireland, USA, Jamaica, and Canada; or Europe vs. Asia. Beer and Cheese Tastings – Selected beers are paired with gourmet cheeses. 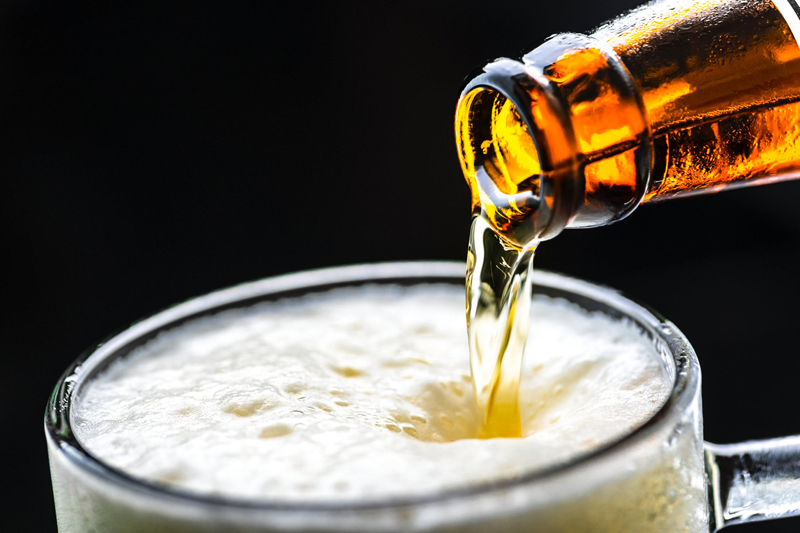 Beer vs. Wine Paired with Food Tastings – Beer and wine selections are paired with the same foods to illustrate how each blend creates different results.